Give your readers a rundown of your work with a crisp table of contents design on Canva. A Table of Contents section is even more relevant in the age of digital documents and electronic books. It gives your readers an at-a-glance snapshot of what they’re about to read, a guide to the chapters that interest them most, and ease of navigation. 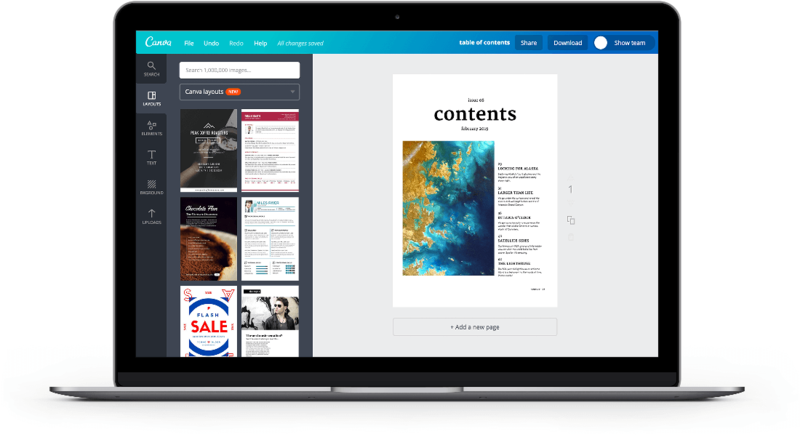 If you’re worried about the time and effort it would take to create one, fear no more because Canva was made for busy writers like you. It’s a simple matter of browsing Canva’s collection of professionally-designed, pre-made templates then editing them as much or as little as needed. You have full control over fonts, colors and other design elements. Create a new Canva account to get started with your own Table of Contents designs. The Table of Contents is not only important, it’s even a way to hook half-interested readers, especially if you’re an author marketing themselves on online self-publishing sites. Most fiction novels need one, non-fiction novels like how-to’s, cooking books and compilations definitely need one, theses and reports are much more professional and put-together with one. Design your Table of Contents in Canva and you can easily go back to edit your file for changes or additions to your chapters. Canva even lets you design on the go, just download our free apps for iOS and Android from the App Store or Google Play. Your Table of Contents page doesn’t have to be boring. With Canva’s easy to use but comprehensive editing tools, you have full control over design elements like font, placement and color. You can even add images or illustrations to complement certain chapters. Canva hosts an amazing media library brimming with high-quality stock photos, illustrations and icons you can drag and drop into your design. Since it gives a preview of your work, why not use it to pique your potential readers’ curiosity by sharing it online? Just go on over to the Download button and save your design as an image file or high-quality PDF for any print or digital use you may have in mind!